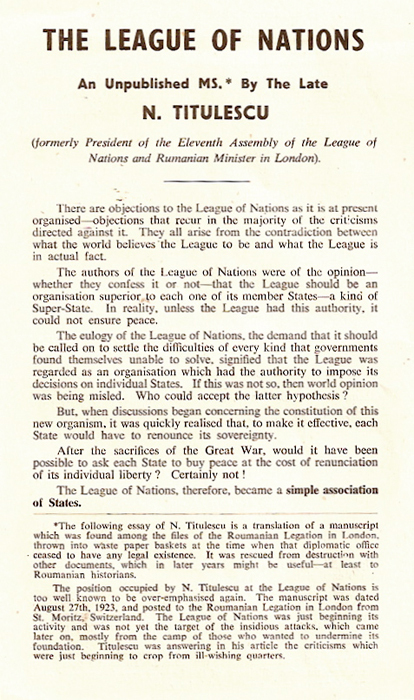 Nicolae Titulescu (later to become President of the 11th Session of the League of Nations) wrote a speech in 1923 to express his views on the League. This is a translation of a document found early in World War Two among files “thrown into a waste paper basket [of the Roumanian Legation in London] at at time when that diplomatic office ceased to have any legal existence. 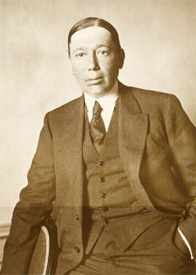 It was rescued from destruction” [by Dimitri Dem Dimancescu who noted that] “with other documents which in later years might be useful – at least to Roumanian historians.” Dimancescu had it published in the British press and also produced a printed version of the Titulescu speech in 1943 despite strict wartime limitations on paper availability.